Skirting the edge of the Pacific, the Portland to San Francisco RAID departure visits one of the most stunning and remote sections of the West Coast. Beginning in the outskirts of cycling-crazed Portland, our route romps through the wine country of the Willamette Valley, then juts to the sea for the long march to California. Coastal climbs and dirt paths made famous by the Rapha Continental. Serene roads glissading through towering redwood forests, verdant moss and ferns beckoning in misty mornings. Along the way, we’ll stay in the artists’ villages and fishing hamlets of the Cascadian coast, enjoying legendary local wine and beer. The final few miles of the ride take in the mighty Golden Gate Bridge before a reception at the Rapha Cycle Club San Francisco. We depart Newberg this morning and making our way through the fertile Willamette Valley, passing orchards, vineyards and fields of hops. Today’s route was featured in one of the 2nd Rapha Gentlemen’s Races and we eventually make our way into the deeply forested coastal mountain range before arriving at the Pacific Ocean. Now lashed to the coast, we head south from Newport (home of Rogue Ales), with scenic breaks at Cape Perpetua, Heceta Head, Cape Arago and on to our final destination, Bandon Oregon, known for the Bandon Dunes. With the trade winds at our backs, we roll along the rugged southern coastline, passing through wildlife refuges, the Cape Blanco lighthouse and Port Orford before arriving at our beachside inn in Gold Beach, our last stopover in Oregon. Today we cross into California via the rugged Oregon coast, weaving inland and out along this quiet stretch of US Highway 101. Once a bustling fishery, this remote coastline was dotted with canneries and Redwood mills, but now remote tranquility reigns. Our destination is the village of Requa and the historic Requa Inn. Built in 1914, this small inn is nestled in one of the longest continuously inhabited places in California. Located in an International Biosphere Reserve and World Heritage Site, innkeepers Janet and Marty will welcome us to their lovely property. Today’s journey dives into deep, dark Redwood groves, crossing the mighty Klamath River, an important salmon spawning ground - and one of the longest rivers on the West Coast. As we approach the gateway of what’s known as the Redwood Empire, we’ll trace the paths of fur trappers and gold miners long past, eventually rolling through Eureka and to the Victorian enclave of Ferndale. Today, we go off the map, deep into the coastal wilderness to follow the famed Lost Coast Road through some of the most secluded regions of California. After spending nearly 65 miles in insolation, we finally emerge into the remarkable Humboldt Redwoods and the Avenue of the Giants, a scenic route aptly named due to the towering redwood trees along this historical road. Winding our way along the Eel River, we head toward the coast again. We land at the ocean at the rugged coastal town of Fort Bragg, founded prior to the American Civil War. We take a quick short side-trip to one of many lighthouses along the remote coastline, before we wrap up today’s ride in the artist colony of Mendocino. Enjoy a glass of Mendocino Pinot at the Cal-French restaurant Cafe Beaujolais this evening. 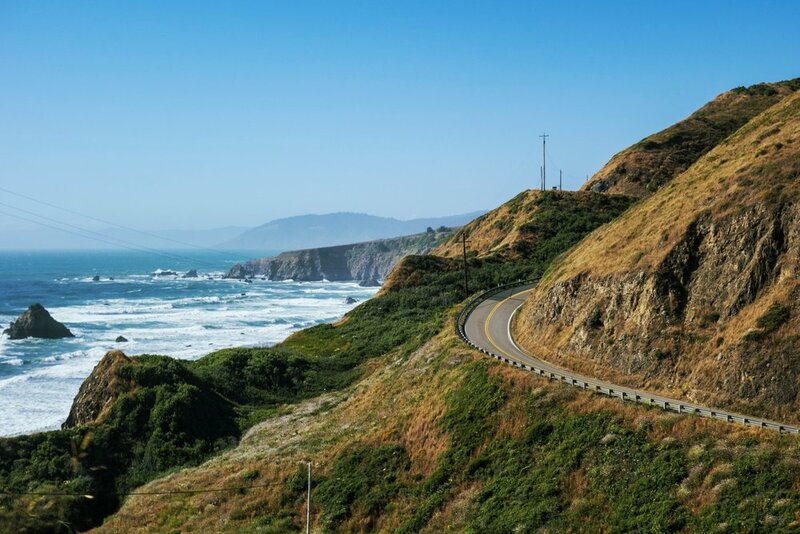 A tailwind chases us along the coastline as we take a few side roads and short deviations before climbing steeply into the heart of the coastal mountains, known as the California Alps. These roads have been featured year after year on the annual Levi’s Gran Fondo. Expect a few secret gravel sectors before we climb into Occidental, our sleepy destination deep in the lush heart of Sonoma County. 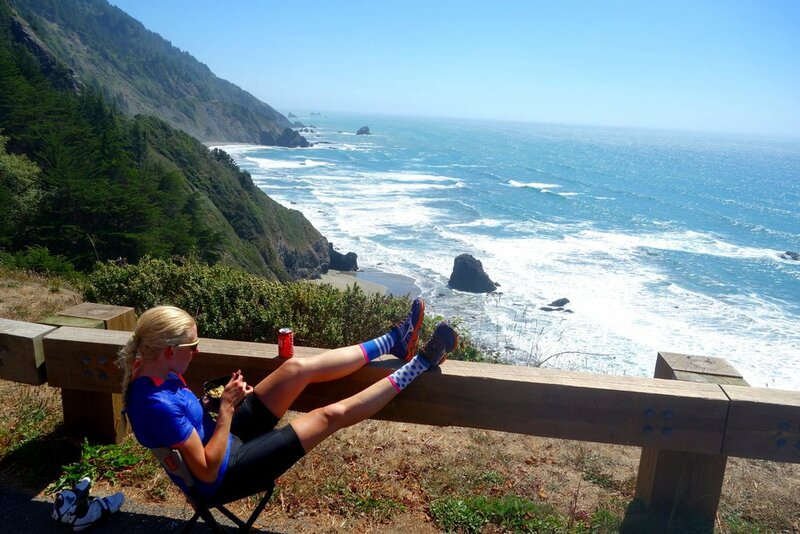 Our last stage takes us along the breathtaking Sonoma coast, following famous Highway One through the quaint towns of Bodega Bay, Tomales, Point Reyes and Bolinas into Marin County. Our final climb of the trip takes us into Mount Tamalpais State Park, before descending into the bohemian burg of Fairfax, birthplace of mountain biking and home to the eponymous Hall of Fame. Grab a coffee before passing through the upscale villages before ending at our hotel in Larkspur, just over the Golden Gate Bridge from San Francisco.